Finally bust out of Sacramento, fully caffeinated and ready to go. Wine tasting for lunch? Why not? 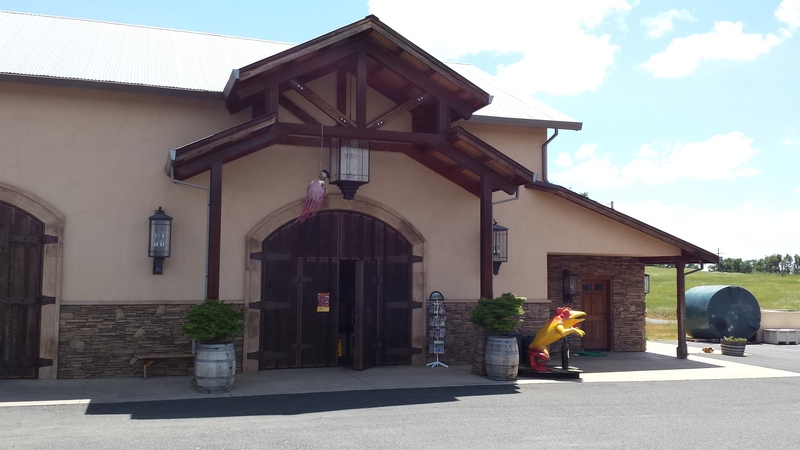 A stop at the Twisted Oak tasting room (twistedoak.com). Still light enough for some cragging so we parked and made the one-minute approach to Church Bowl and climbed Uncle Fanny. Although Yosemite has 100’s of thousands of backcountry acres to explore, there is nearly unlimited climbing to do with very short approaches from the valley floor. Uncle Fanny is a great introduction to the notorious Valley off-widths and chimneys. Dinner at the Curry Village pizza deck (as guilty as you may feel, this is a must do). Notice the correlation between amount of clothing and home-town climate – full puffies and hats: Oakland, CA; light puffy vest and hat: Portland, OR; light long sleeve merino and no hat: Missoula, MT. 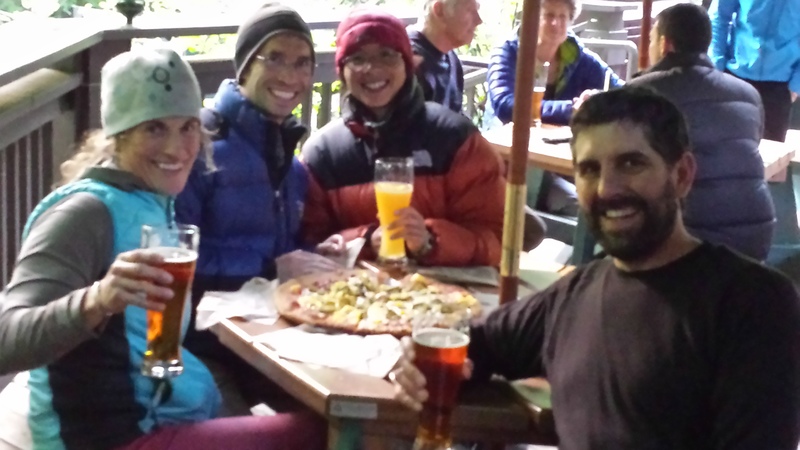 Pizza and beer in Curry Village. El Cap Base. Erick and Robin jump on Sacherer Cracker while Erica and I head to Little John (right). Things got a bit interesting here. While half way up the second pitch I heard a loud crack followed by the sound of rocks bouncing off rock. My first instinct was to act like a lizard and get as close to the wall as I could, taking some shelter under a slight bulge above me while listening to rocks rifle by and crash into the oak trees below. Erica, who was belaying me, saw the rocks falling from far above and described them as basketball sized. There was another party on the first pitch and we all made the decision to bail and clear the area. Luckily I was in a position where I could easily down climb to the anchors at the top of the first pitch and rappel. This was A LOT of rock. It had spread out on its path to the ground, puckering climbers from Little John (right) to Sacherer Cracker, with the brunt of it I think falling directly over climbers on the La Cosita climbs. We were later to find out that the cause was climbers on the Salathé Wall pulling loose a block just above Heart Ledges, around 1,000 feet above us. The block broke one climber’s foot, initiating a rescue by YOSAR. Looking up Little John (Right). Erick “hanging out” on El Cap. After watching Erick and Robin climb for a while, we headed over to the super crowded Church Bowl again to get on Bishop’s Terrace – it was worth the wait! Climbed Munginella and Commitment on Five Open Books for a six-pitch day. Both climbs are fantastic but I have to say Commitment was the highlight of the trip for me. 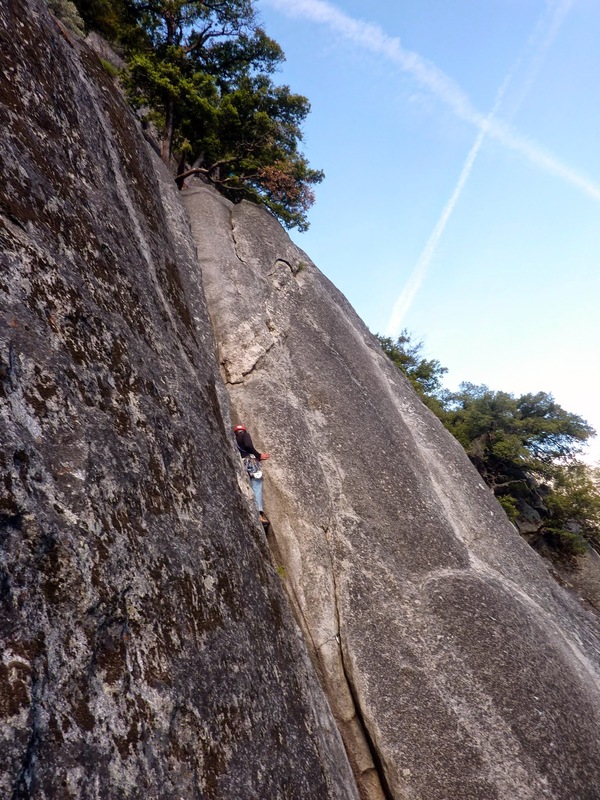 Needing to get back to Sacramento to catch our flights, we opted for some quick morning cragging at Swan Slab and showers before hitting the road. Well although I can’t say we got a lot of climbing in, it was a fantastic first road trip of the season in a spectacular place with good friends. And really, isn’t that what it’s all about? Good stuff! And very astute observation regarding the wardrobe vs. town of origin correlation. Great blog. You started your season off right! How about an Oct trip to Red Rock?